I finally succumbed to tech lust and upgraded my main computer. It’s been over three years and was still doing everything I needed but I wanted more. With the great overclocking available with the Intel i5 and i7 series processors I needed a good CPU cooler. I immediately started looking at the traditional heat sink and fan combo since water cooling was out of my depth: complicated and all encompassing tubes connected to pumps, reservoirs, radiators and water blocks. 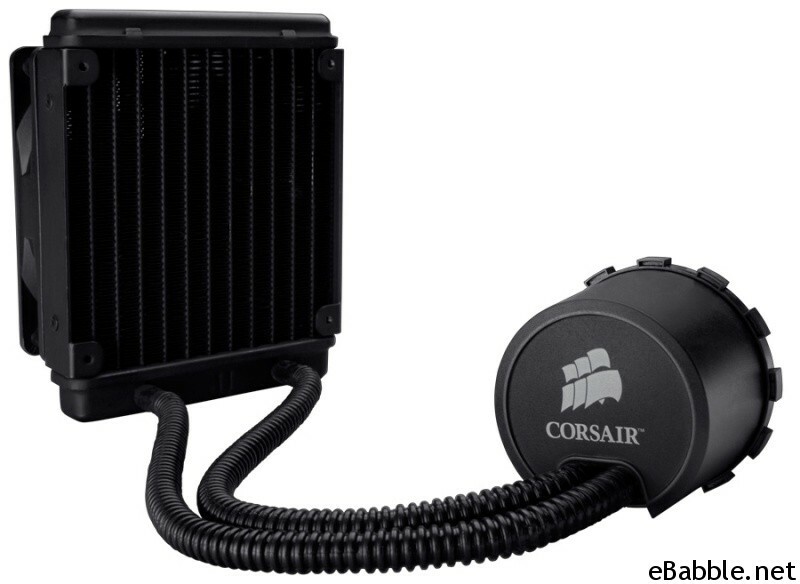 At that point I remembered some reviews of an all in one water cooler that was easy to hook up and didn’t require any maintenance: the Corsair H50 CPU Cooler. Looking at the above you can see it’s pretty simple: a sealed unit with the pump in the CPU heatsink connected to the radiator via two tubes. The fan screws onto your case, the radiator onto the fan and the pump/heatsink attach to the CPU socket via a circular adapter than mounts to the front and back of your motherboard. Installation is very straightforward via simple one page setups for each socket type; all current Intel and AMD sockets are supported. As well Corsair has made an excellent installation video that is a lot easier to follow than even the simple diagrams. I did encounter a few issues in my installation. Corsair recommends the fan attached to the radiator pull air from the outside into the case, thus providing cool air to the radiator. This is fine but now you’re introducing hot air into your case so make sure you have plenty of exhaust happening. I installed this in an Antec P182 case and the 140mm ceiling fan did a good job expelling the radiator’s hot air. The pump/heatsink has teeth that fit into the circular socket mount; this is a great solution that keeps the unit firmly in place. My issue was tightening the four screws; I hand cranked them to what I thought was a tight fit bu found my system overheated and shut down until I tightened the screws as much as I could by hand. The radiator fan and the pump both have three pin fan connectors: Corsair recommends the fan be connected to your motherboard’s CPU fan header and the pump to any other fan header. I did this but found the pump fan header I was using was trying to vary it’s speed and the pump needs full power at all times. Searching through my BIOS I had to set all my fan headers to full and couldn’t leave the CPU fan header managed. I had a three pin to molex adapter from an old heatsink that I connected instead; this kept the pump at full power and eliminated the last of my heat issues. I think Corsair should include such an adapter in the box. Let’s get to performance. I don’t have comparisons here but can say how it went for me. In an Antec P182 case with a front 120mm intake fan and roof 140 exhaust fan the H50 kept my stock Intel i5-750 processor at 35C under full load with Prime95 on all four cores. I overclocked it to 3.2 GHz and under full load went to 40C. That’s nice cooling, indeed. With game playing and my GTX260 going full out I saw a high of 44C. There’s lots of head room there for me to reach 3.8 GHz and still be safely under 70C. Corsair has a nice article on adding a second fan to the radiator to help lower temperatures even more. The other big point here is noise, or lack of it. The H50 is very quiet; the pump is inaudible and the intake fan running at 1400 rpm most of the time is also very quiet. Once I had the Corsair H50 installed correctly it was smooth sailing.